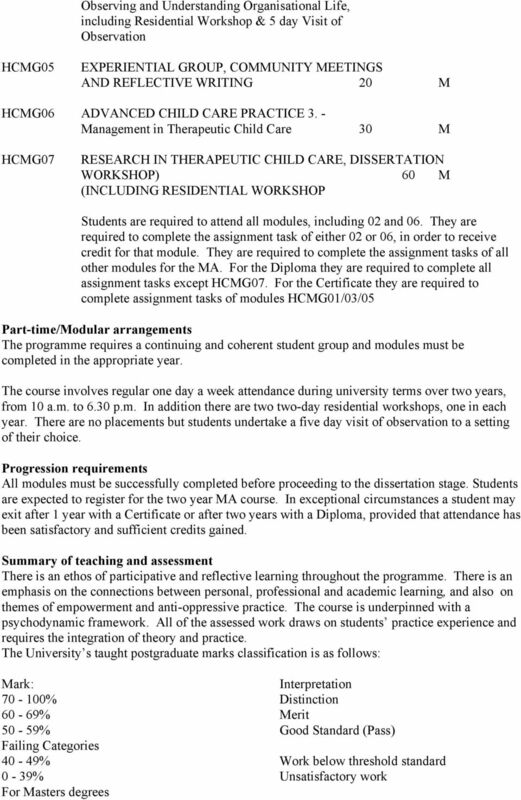 Download "HCMG02 ADVANCED CHILD CARE PRACTICE 2. 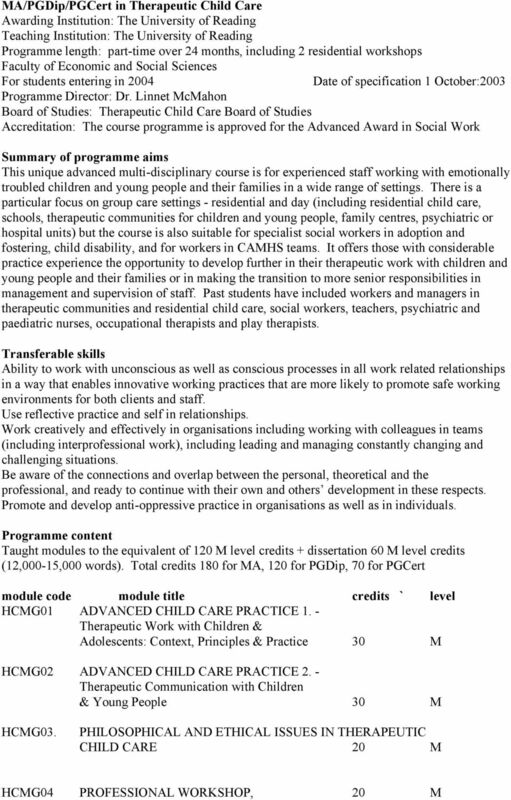 - Therapeutic Communication with Children & Young People 30 M"
5 A. Knowledge and understanding of: The therapeutic community model of practice and its application in different settings and agencies. 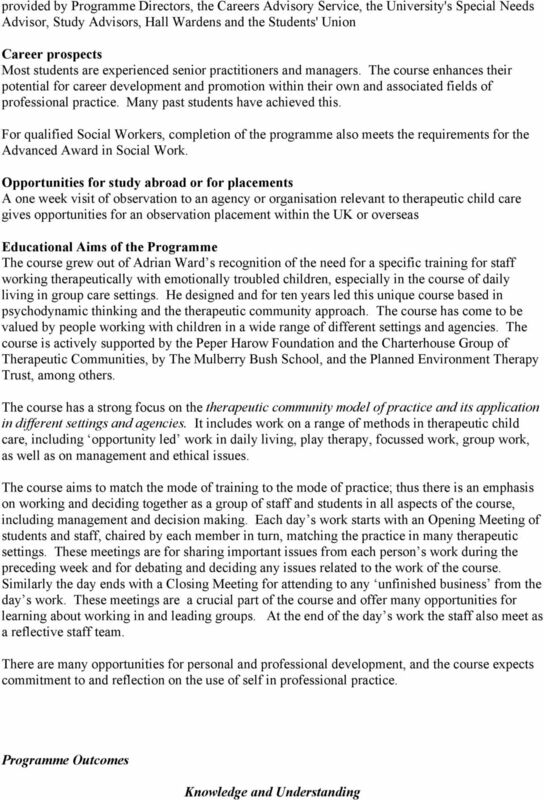 Advanced Therapeutic work with children Philosophy and ethics in therapeutic Child Care Processes and dynamics in groups and organisations in child care Management and leadership in therapeutic child care Reflective practice and the use of self in therapeutic child care Current child care policy and provision issues A style of teaching and learning which endeavours to create an environment for student learning matching the best practice in therapeutic work A variety of methods with an emphasis on seminar discussion and debate based on prior reading, and student presentations based on practice situations, together with professional workshops and the use of weekly course meetings and a weekly experiential group. There is also a residential experience and a 5 day visit of observation. Individual and group tutorials are provided.. B. Intellectual skills: ability to Systematically analyse current policy issues and provision in therapeutic child care. 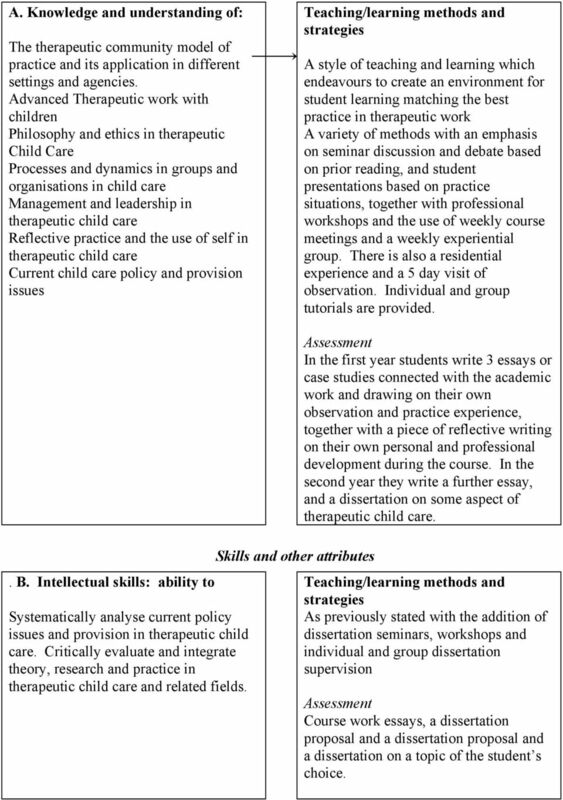 Critically evaluate and integrate theory, research and practice in therapeutic child care and related fields. Skills and other attributes In the first year students write 3 essays or case studies connected with the academic work and drawing on their own observation and practice experience, together with a piece of reflective writing on their own personal and professional development during the course. In the second year they write a further essay, and a dissertation on some aspect of therapeutic child care. As previously stated with the addition of dissertation seminars, workshops and individual and group dissertation supervision Course work essays, a dissertation proposal and a dissertation proposal and a dissertation on a topic of the student s choice. 6 C. Practical skills able to: Work in and lead groups, work effectively as a member of a team and organisation, manage staff teams. Assess and make provision for the therapeutic needs of emotionally disturbed children or young people. Provide therapeutic communication with children. Work in a way which promotes anti-oppressive practice As previously stated. Written work must show evidence of sound child care practice. D. Transferable skills able to: Work with unconscious as well as conscious processes in all work related relationships in a way that enables innovative working practices that are more likely to promote safe working environments for both clients and staff. Use reflective practice and self in relationships and enable the understanding of the interplay of role and relationships and the influence of hierarchy in organisational settings. Work creatively and effectively in organisations including working with colleagues in teams (including interprofessional work), including leading and managing constantly changing and challenging situations. Be aware of the connections and overlap between the personal, theoretical and the professional, and ready to continue with their own and others development in these respects. Promote and develop anti-oppressive practice in organisations as well as in individuals. As previously stated Through written work as described. 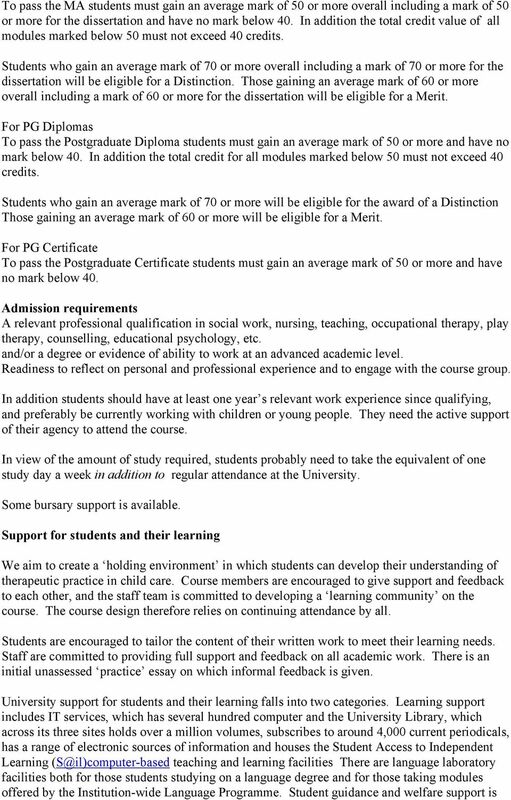 Please note: This specification provides a concise summary of the main features of the programme and the learning outcomes that a typical student might reasonably expect to achieve and demonstrate if he/she takes full advantage of the learning opportunities that are provided. More detailed information on the learning outcomes, content and teaching, learning and assessment methods of each module can be found in module and programme handbooks. The MSc programme offers four specialisations: Biodiversity Informatics, Computing Informatics, Construction Informatics, and Health Informatics. SCME Board of Studies for Postgraduate. Chartered Institute of Building (CIOB), Chartered Institution of Building Services Engineers (CIBSE).